It has been a long time coming, but the day is finally here. Frightful Hobgoblin is proud to announce the release of the English translation of Nicolas Dessaux's Epées & Sorcellerie roleplaying game, now available in both print and pdf versions from Lulu. The pdf (7.4 megs) is a free download, while the print copy (8.5 x 11 paperback) has been released at cost and can be purchased for $9.57 US (€6.68). Inspired by Original D&D and Chainmail, along with some modern additions, Epées & Sorcellerie is a complete game in just 68 pages. Players can be human, orc, elf, dwarf, or halfling, and become a warrior, priest or sorcerer up to level 12. 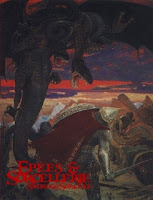 With some interesting variations on familiar themes, whether you play it in its own right, or mine it for ideas to use with your current game, the Epées & Sorcellerie RPG is well worth checking out. And you can do so for free! So what are you waiting for? I really enjoyed reading the the free PDF. 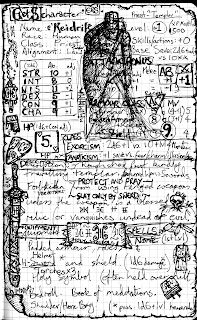 I have a scan of a E&S character which I'd rolled up in a notebook and preceded to doodle over the character stats, in a way that would have probably got be banned from a gaming table for not paying attention to the DM. It's a type of Templar Knight using the Priest class - I was letting him use a sword on the proviso that he wouldn't be allowed to use missile weapons unless they were blessed with powers relating to fighting evil or the vanquising the undead. Like a religious thing, not a phobia thing, an awkward Cleric thing, y'know? I was thinking about drafting a sort of Thief class but since the skill checks in E&S are linked to level, there seemed little point to start listing different Thief skills per level. Also the high-Dexterity-in-place-of-armour-class rule naturally encourages agile warriors to travel light, a definite plus for the Conan types and appropriate for Elvish rogues. Suddenly I'm reminded of the way I play the rangers in Baldur's Gate - stripping down from plate to leather so that they can go scouting in the undergrowth with the thief. For a Thief class in E&S (should it be needed) perhaps just some guidelines written for managing thief skills are needed. The experience / hit dice / attack bonus could be estimated from the Priest table. Musings aside. It's a shame that I won't get to play this game in the near future (group play is just not in the schedule atm), because I suspect that with all really simple systems the true positives and limitations are only revealed in play. Tunnels and Trolls pretty much survives though (despite the MR vs. stats divide). 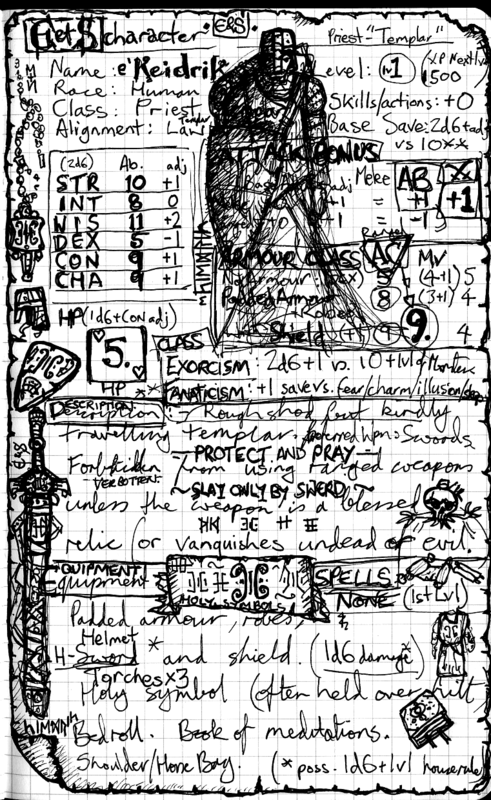 Definitely for a DM E&S an less than daunting game to prepare adventures for, whilst for the players the simplicity might be be liberating, especially for beginner players (if you overlook the high probability of instant death which is common and apt in an old-school simulacrum ... Perhaps with very new players one could substitute Constitution for HP which ever is higher - remember that Constitution is only a range of 2-12 mostly superseded at 2nd level as a Warrior, 2d6+2 HD, for example...?). I'm also very fond of games which would adapt well to solo text based play (in the absense of group play, I can fantasise about returning to authorship... long story).